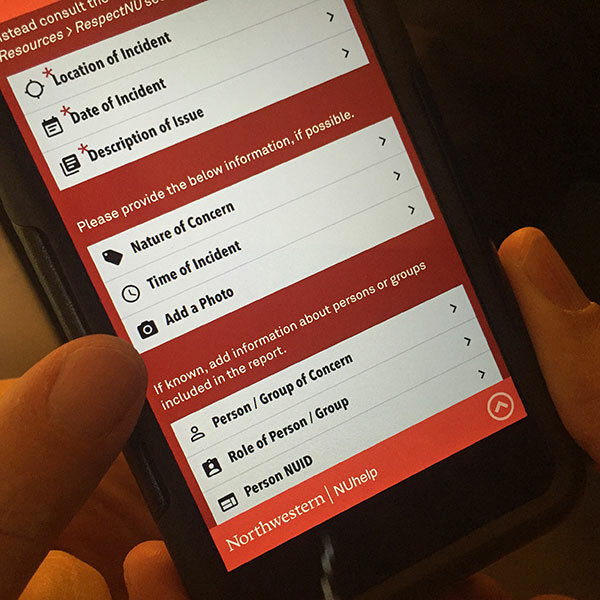 The NUhelp app, an Android and iPhone mobile app for navigating safety and wellness at Northwestern includes features that let you map your walk (Maps), ensure a friend gets home safely (SafeWalk), report a concern, find Wildcard discounts and more. The Division of Student Affairs developed this app in-house in collaboration with 23 separate offices and multiple data source providers. See something or witness something? You can report it here. Upload photos (optional) when reporting a concern. Not to be used for Sexual Misconduct or Hate & Bias reporting. Click here for Sexual Misconduct or Hate & Bias reporting. AccessibleNU—Northwestern & AccessibleNU work to provide students with disabilities and other conditions requiring accommodation a learning and community environment that affords them full participation, equal access, and reasonable accommodation. Alcohol & Other Drug Resources—programs and training about alcohol safety, as well as support for students struggling with substance abuse. Center for Awareness, Response, & Education (CARE)—CARE provides services for survivors of past or recent trauma, and friends of survivors, including confidential support and advocacy services, education programming, and referrals. Office of Religious & Spiritual Life—The primary mission of the Office of the University Chaplains is to promote spiritual growth and nurture at Northwestern University. Counseling And Psychological Services—CAPS serves as the primary mental health service at Northwestern University with offices on both the Evanston and Chicago campuses. CAPS provides a set of core services, including clinical services, educational workshops, and consultation with faculty, staff, and parents. Dean of Students Office—The Dean of Students Office serves, supports, and empowers students and other members of the Northwestern community to promote student success. Health Service—Northwestern's resource for medical care and provide health education to ensure your academic and campus life is a healthy one. RespectNU—reporting service for Bias and Hate incidents. Suicide Prevention Gatekeeper Training—a training program to help community members recognize and assist suicidal individuals. 24/7 Neighborhood Desks Neighborhood desks are always staffed by a Campus Safety Officer. Please contact them if you are nearby one of the res halls and need support. Safe Ride Safe Ride is a safe and free alternative to walking alone after dark. It operates throughout the academic year. Blue Lights Situated throughout the campuses, pressing the emergency call button on any Bluelight connects the caller with NU Police. NU Shuttles This shuttle is a free service for NU Students, Faculty and Staff (Requires a WildCard). Upload a profile photo of your choice, or even your WildCARD photo! Give us feedback about the NUhelp app at the bottom of the Profile screen. Click 'Nearby' in the right hand upper corner. Click on Wildcard Advantage Discounts to find out where you can use your Wildcard to get discounts. Get walking directions to your favorite places on campus and other Northwestern-related locations. Notify a friend to make sure you reach your destination safely. Enter your destination, your estimated travel time and cancel the app when you have arrived at your destination safely. 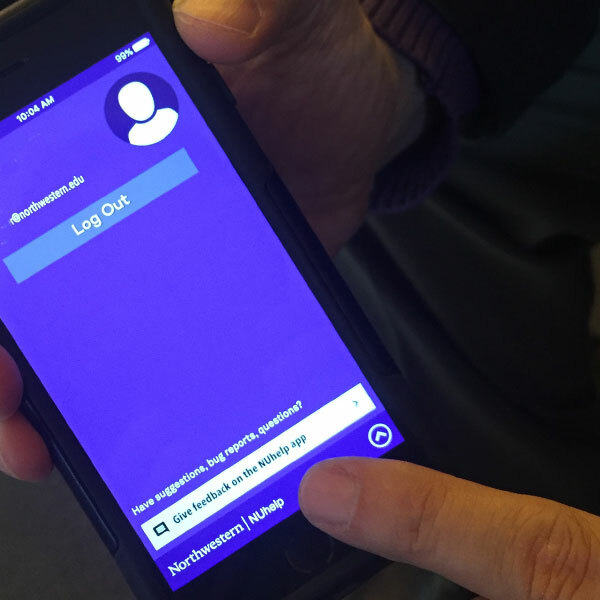 The SafeWalk feature of the NUhelp app is available to students, staff and faculty who use their Northwestern University NetID login credentials. To successfully use the SafeWalk feature, your location finder must be turned on inside your phone’s software. When SafeWalk user cannot be contacted and the friend calls NUPD, the police will initiate their protocol which includes tracking the phone’s travel-pathway and attempting to call the SafeWalk user. If unsuccessful, NUPD will deploy an officer to the tracking location to assess. The SafeWalk feature works in Evanston on the Northwestern Campus and adjacent areas nearby where NUPD has patrol jurisdiction (roughly Lake St. to the south, Green Bay Rd. to the west and Isabella St. to the north).